Sometimes called the "poor man's Staffordshire", Chalkware is a misnomer for decorative figures or plaques made of plaster or plaster of Paris. The ware was developed in the mid-19th century as a means of producing affordable replicas of the popular, and pricey, Staffordshire Pottery figures of the mid- to late 1800s. Pieces were made in half molds and the two parts cemented together, leaving a hollow center. Some large pieces were cast in a single piece and weighted. The model, image or fruit, was brushed with olive oil, then covered with plaster two inches thick; when dry it was cut in two, the casts were oiled on the inside and bound together with string or tape, and into this two-piece mold the wet plaster to form the image was poured. 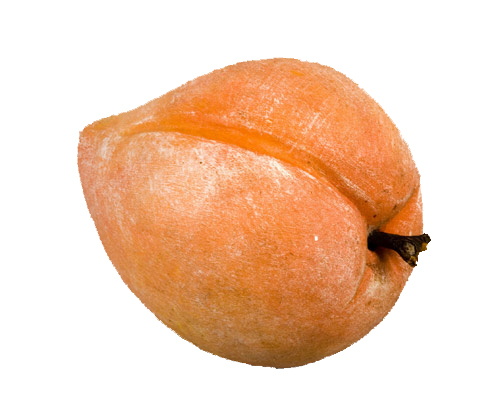 This particular example is a piece of fruit . . .An over-sized apricot! It is huge! Measuring 5.75 inches long, it has a wooden stem and a fantastic surface with its original paint. The condition is excellent. This one is really fun!